When I was a young guy trying to make his way through school selling cars, I cut a deal with a shady mechanic to buy a black 1991 Nissan Fairlady Z32, right hand drive, RWD Coupe. It was my second car, but the first car that I was going full on commando with (no parents help in terms of Insurance or Credit). I made the deal with the guy, and bought it outright for $3000. I felt like I was very compatible with the car itself, despite the fact that the rear shocks had gone loose, and the rear brakes were off a 240SX (Previous owners cheap conversion - I guess he sold the Z32 brakes). 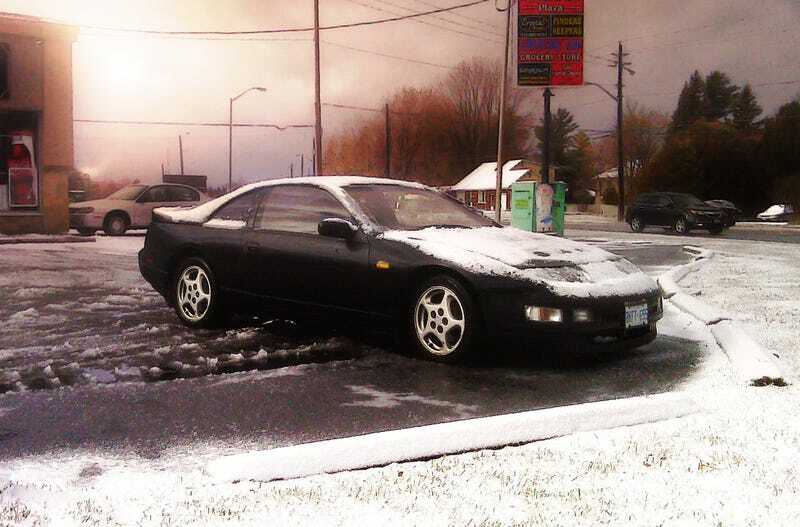 In any case, the main reason I felt like I was so compatible with it was due to the moderate power, RWD, front engine layout with the 5 speed manual transmission... which is ironic, because those were all the things, plus the advent of weather, that lead to my very "incident". I would often take it out drifting, or up the mountains at a decent rate of speed, which retrospectively, was rather reckless in and of itself. This lead to a very quickly almost erased set of rear tires. With little to no grip, I decided (like the idiot I was) to head out to Montreal from Ottawa one day with it and pick up the new tires which I had found for cheap... in the pouring rain. Halfway through the journey, I stopped for gas. As I was done filling it up, the rain started to come down hard. I could see people scrambling for cover, so with a bit of urgency, I clambered to get out of the gas station parking lot, and onto the highway, while everyone else was stagnant. There was (at that time) nothing I loved more than driving in the rain. I started the car, and headed for the exit back onto the main road that lead to the highway. As I came out of the lot, the rear wheel rose up and over the curb. As it hit the curb, I prodded at the throttle just a bit too much, and when the car landed on it's rear wheels again, in a large puddle, the rear wheels were spinning at a higher RPM than the speed. I'll never know what lead me to prod the throttle to get over the curb... I assume I had seen it jutted out, and my immediate thought was that I would need to get some throttle to get over it. I dunno. I don't remember. I know I must have been about 2000-2500RPM over what was necessary though, because as the cars rear wheels hit the ground, with my steering wheel pointed left, the rear of the car spun out rather quickly. Rather than allowing the whole rear end to spin out and hit the curb or even worse, go over the curb, I gassed the throttle and quickly counter steered, which in turn produced a very sudden shift in rear pendulum direction, now to the left. I modulated the throttle out in a straight line, and more than a little startled, I pulled over into a parking lot for a few minutes of cool down time. I remember thinking that I was glad that I had powered out instead of braking or letting go of the throttle, because I would have damaged the car, possibly hurt myself, or been in someone else's way. As I pulled back onto the road, I saw the lights. The OPP Officer was not going to accept any excuses. He was certain of what he'd seen, and immediately scolded me for being reckless and endangering myself. "You usually drift out of parking lots?" "Sir, I swear on my life. You see, my car has no traction control and my rear tires are almost bal..."
"So the car's not safe for the road?" "I was going to purchase new tires today, I didn't th..."
"Listen, I know what I saw. I saw you drift out of that lot. That's reckless driving. Minimum, $600 fine. 6 months suspension." "Insurance and Registration, and License please." With that, I handed it to him. When I went to court to dispute the ticket, he was there to counter me. Thus, my license was suspended for 6 months. That was 3 and a half years ago now. But I learned from it, and I've learned to be more respectful of my car and the road conditions, and to more properly maintain my vehicle. What's your worst legal experience behind the wheel?